"The world looks soooo different when you're hanging upside down!" Henry Dupere Hanging Bat with Open Wings Garden Sculpture is available in small as shown as well as large, see more info...Bat Trivia: The bat is a mammal. The bat is also the only form of mammal to have attained powered flight. A single bat can eat up to 1000 mosquitoes in 1 hour. Around the world the bat is a symbol of luck & happiness & is considered to be a protector by Native Americans. Fewer than 0.05% of bats have rabies. 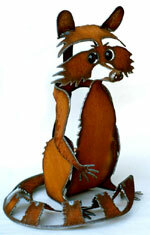 The Dupere Bat Garden Sculpture is also available in a larger size Please use drop-down for ordering. 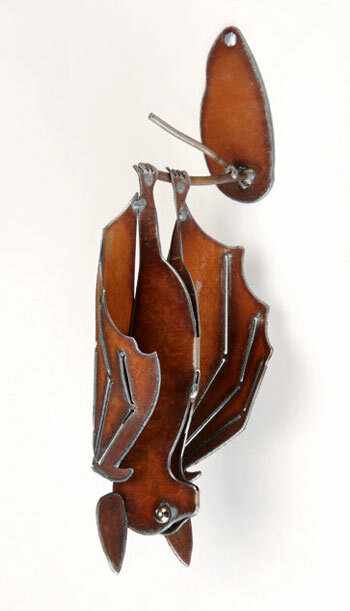 Henry Dupere Hanging Bat with Open Wings Rusted Metal Garden Sculpture. Size: Small Hanging Bat with Open Wings Garden Sculpture, Overall length 15". Size:Large Hanging Bat with Open Wings Garden Sculpture, overall length 18.5".